JEANANN VERLEE is an author, performance poet, editor, activist, and former punk rocker who collects tattoos and winks at boys. Her work has been published and is forthcoming in a variety of journals, including The New York Quarterly, PANK, decomP, Lung, The Legendary, and Spindle, among others. Her poems have also been included in various anthologies such as “Not A Muse: The Inner Lives of Women” and “His Rib: Poems Stories and Essays by Her.” Verlee’s first full-length book of poems, Racing Hummingbirds, was released by Write Bloody Publishing in March, 2010. 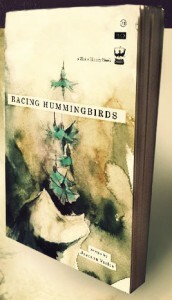 I recently read Racing Hummingbirds, one of the strongest poetry collections I’ve ever read, and Jeanann and I had a great e-mail conversation about her book, her poetry and lots of other things. Why are you hiding your face in your author photo? Does it appear that I’m hiding? The cut frame/focus of the photo was the photographer’s vision – I enjoy that it is not a standard headshot. This one was selected to evidence my quirky sense of humor. I tend to appear somber in most professional portraits, so the publisher pushed for this one. You’re a fan of letter writing campaigns. Who have you written to lately and is there power in letter writing campaigns? Have you had any success protesting in this manner? It’s been a while since I found myself stirred up enough to send out a barrage of letters, but for a long period this was my primary activism. The power, like most things, lies in numbers. So while I can’t know if there are 3,000 – or 30 – other action letters piled up to voice protest, at least I know I count for a plus one. It matters. Most corporations accept a 1:10 ratio – for every one voice, ten others agree but remain silent. Regardless, the typical response is a placating form letter. (Ease down, little activist, we’re not the bad guys, we promise!) The one tangible success I personally received involved complimentary drink coupons from Starbucks after a surge of no-more-curdled-soy-milk letters. Score 1 for the little gal. I read that you have a theatre background. How does performance work influence your writing? I strive to disallow performance ideas to influence my writing process. I work to write for the page. Later, working through edits, I review the piece to see how it sounds/feels aloud. What do you enjoy about performing? I enjoy taking risks. Changing a room. Being different. I enjoy the body as instrument and the control in delivering the words as I hear them in my head.